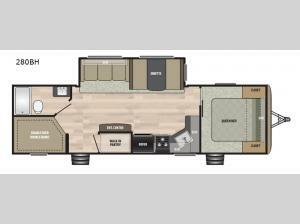 In this Keystone Springdale travel trailer model 280BH you have plenty of room for hosting and sleeping up to ten individuals throughout your vacation. There is a queen bed in the front private bedroom, double over double bunks in the rear, a sofa, and a booth dinette that folds down so that you can have an extra sleeping space. You have places for relaxing, cooking, playing games, or talking late into the night with your loved ones. Don't be afraid to bring along as much as you want. You have a large pantry, a few overhead cabinets, and dual closets in the bedroom for storing your travel items.